Pupils from St Joseph’s Primary in Milngavie and St Andrew’s Primary Bearsden have demonstrated just how responsible they are as local citizens. They are the latest young people to successfully complete the Council’s Junior Warden Scheme – a project designed to help children be responsible and avoid anti-social behaviour. The P5 pupils from both schools recently took part in classroom lessons and external activities to learn about community safety and what it means to them, their families and their community. As part of the Junior Warden Scheme fire officers from Milngavie Fire Station discussed fire safety with the children and taught them crucial CPR skills. Pupils also enjoyed talks from Community Police Officers, an NHS Health Improvement Officer on smoking as well as input from the Mugdock Ranger. They kept notebooks detailing what they learned and were presented with certificates to recognise all their hard work. Jessica of St Joseph’s and Ewan of St Andrew’s were also presented with £10 gift vouchers as their notebooks were judged the best. Depute Chief Executive, Education, People & Business, Ann Davie, said, “These new Junior Wardens in Bearsden and Milngavie are now armed with the skills and knowledge to help make better life decisions and be good citizens. 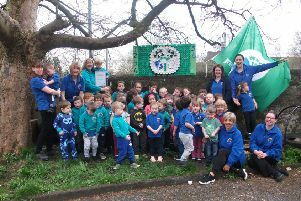 “As well as CPR, they learned about their responsibilities whilst in the countryside and the damaging effect litter can have”.